There are 2 versions. The first one is for most people. The second is for if you want to edit the Script or use it in Keyboard Maestro. This is the easiest. Click on it and it will install and then you can assign it to a hotkey using System Preferences. 3. Now go to System Preferences: Keyboard and go to the ‘Shortcuts’ Tab. 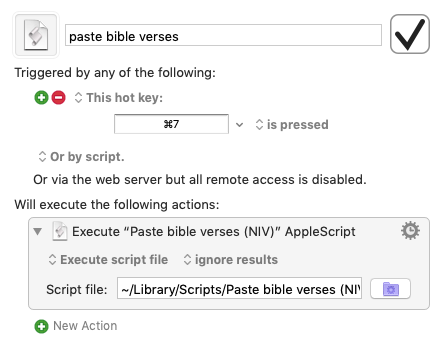 Select Services and look for the new ‘Paste Bible Verses’ option. Click on ‘Add Shortcut’ and press Apple-7 to assign it to the Apple-7 key. 4. That’s it. 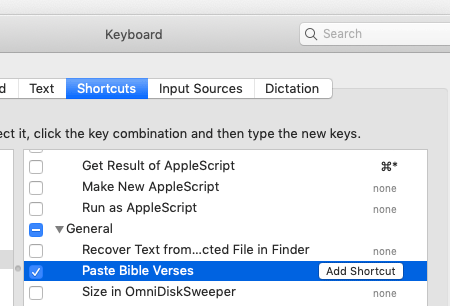 Now from any application select Apple-7 and you can paste in Bible verses from Accordance. If you want another version (not NIV) let me know and I can make another version. NOTE: Each time you run the ‘Paste Bible Verses’ in a new application (e.g. Word, Pages, Mail) it will ask for permission to run. You may also be taken to System Preferences and asked to allow that program to control your computer. This is to make sure that you have allowed the script to run. e.g. Use this version if you have Keyboard Maestro. You can assign it to any key you want with Keyboard Maestro and drop the AppleScript in. You can also customise it to paste from GNT, ESV etc. The Applescript version remembers your last typed verses. The automator version reverts back to Genesis 1:1 each time. 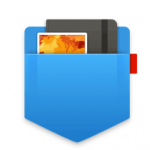 Please help petition Microsoft to allow multiple documents in the same Word window. Awesome! Thank you for your hard work on this!